The SCALE-IT-UP project, funded by the Luxembourg National Research Fund (FNR) under the CORE scheme, will investigate the role of city size, measured in terms of population and artificial land use, on a set of environmental and economic attributes. Re-scaling cities to control for variation in population and land use, allows for relevant comparative analysis. The scaling with population of structural aspects of cities is examined, namely the internal organisation of built-up land, non-built land and transport, thus providing the ability to separate city size effects from urban and transport pattern effects on environmental outcomes. The outcomes from this project can inform urban policy around how to organise the built, non-built and transport elements of a city in a more sustainable manner, irrespective of city size or given the particularities related to its size. The empirical evidence based on a large set of cities is lacking. This will be a major deliverable of this project. In the mid/longer run, this research should also support urban planning policies by suggesting generic sustainable strategies for organising cities internally and/or adapting these strategies to city size if needs be. In addition, given that intra-urban and inter-urban are typically analysed separately, this project will bridge this gap, at least from the empirical point of view. Progressing the linkage between urban scaling laws and intra-urban approaches is a second objective of the project. The goal is not “simply” to prove or disprove that cities are “greener as they get bigger”. The goal is to understand how, the relative arrangement of land use, and their conjoint (or differentiated) dispersion from city centres, affect sustainable environmental outcomes. This research follows on from a previous FNR funded project “ALONSOEU” by Prof.Geoffrey Caruso and Dr. Remi Lemoy. 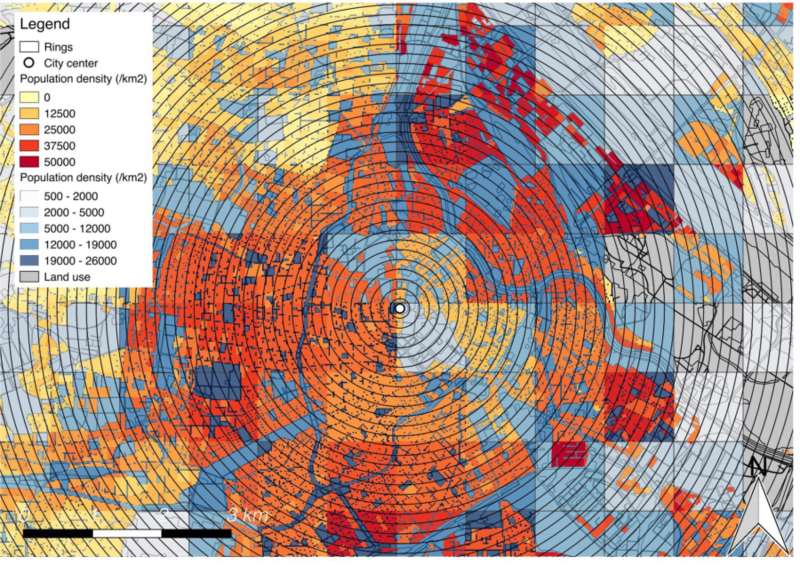 This research analysed the GMES/Copernicus Urban Atlas 2006 land use data for 300 cities along with Geostat data at a spatially disaggregated scale. Using radial analysis two scaling laws were developed, one for land use and one for population density. A consistent pattern of radial profiles across different city sizes was discovered. In other words, cities of varying sizes have similar land use and population density profiles, this also challenges the claim that larger cities are more efficient in the use of land per capita. This work built upon previous literature which examined population and surface area by extending this to a radial distance profile, thus linking intra-urban radial analysis and systems of cities.